Chef Jonny Roscher: race chef. This month the National Hot Rod Association (NHRA) is coming to Gateway Motorsports Park (700 Raceway Boulevard, Madison, Illinois; 618-215-8888). Gut Check's initial reaction was a collective "meh", but when we found out that all of the international race teams bring food trailers with their own personal team of chefs, we plugged our ears, breathed in some race fumes and sped off towards the track -- because food is a race for the prize that's relevant to our interests. After its closure in 2011, Gateway was purchased by real-estate developer and former racer Curtis Francois, who immediately set out to bring the NHRA to St. Louis in a big way. Not only did he get the NHRA to come around this year, but he convinced them to come to Gateway for the next twenty years based on a freaking hand shake. Francois credits the NHRA fans in and around St. Louis for creating interest: "There's a huge amount of grassroots support for the NHRA in St. Louis." For those not familiar with the NHRA, they're basically the NASCAR of drag racing. 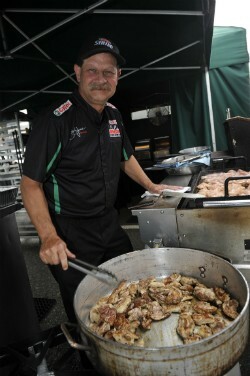 Unlike the boys club over at NASCAR, the drivers of the NHRA are a more diverse, eclectic group according to Francois. "Unlike NASCAR, in the NHRA you've got female drivers like Courtney Force who not only race, but win." The event takes place Friday, September 28 to Sunday, September 30, and promises a lot of fun. "These races are really entertaining. Fans get the opportunity to talk to the racers and watch the pit crews up close." says Francois. He advises that anyone who wants to come bring sunglasses, earplugs and a Sharpie for autographs. Gut Check will be on hand taking pictures and speaking with some of the drivers and their crews, as well as trying out some of the tasty fare made by these "race chefs." For more information about the event or to purchase tickets, check out GatewayMSP.com.